Surely many of us have experienced this: the alarm clock rings only to be slammed down or turned off and our tired body lulled back into sleep. When this happens, the body will only jerk into attention at least half an hour have later and we are hopelessly late for that important date or appointment. 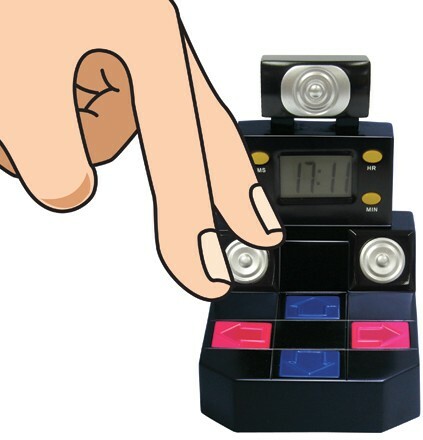 The Finger Dance Alarm Clock is designed especially for people who need to be literally taken through an exercise routine once the alarm goes off so that they don’t drop back into sleep. The Finger Dance Alarm Clock looks just like any other electronic clock with an easy-to-read digital display, a snooze button and a backlight for night reading. Measuring 41.5 x 38.5 x 30.8 cm in dimension, the alarm clock looks nondescript except that it requires an alert mind and nimble fingers to key in the lit-up sequence of digits on the keypad when the alarm goes off. Otherwise, the incessant ringing will wake you up anyway. By applying the idea of the electronic dance mat game in a digital clock, the designer may have hit on a winning combination that is both fun and practical. For $16, you can have an alarm clock that is guaranteed to pester and challenge even the most reluctant early birds.